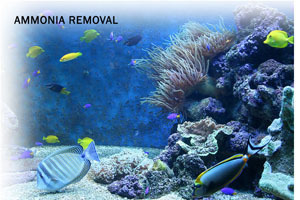 Safely eliminate toxic ammonia from aquariums, the 1 killer of fish. Ammonia removal reduces stress & disease in fish with AmmoSorb Eco Aquarium Ammonia Removal Granules. AmmoSorb is eco-friendly, non-toxic, natural & safe for people, fish & the planet. AmmoSorb Ammonia Removal Granules were specially developed to solve the problem of toxic ammonia levels in the aquaculture industry and aquariums . AmmoSorb will trap ammonium ions on contact and thereby reduce toxic ammonia concentrations. AmmoSorb is capable of removing up to 99% of ammonia from water and result in a safer and healthier environment for fish. Removal of ammonia results in improved growth and appetite as well as lower stress and disease. To use, simply apply the recommended quantity following the filter manufacturers' directions for installation of filter media. For goldfish bowls, use 4 teaspoons AmmoSorb for each goldfish. It can also be directly applied to aquariums, ponds, and shipping containers. AmmoSorb is non-toxic, safe, reusable, recyclable, natural, odorless, non-flammable and non-caustic. AmmoSorb is an ideal environmentally friendly solution for eliminating dangerous ammonia odors without adding pollutants to the air you breathe. It does not contain VOCs, harmful or ozone depleting chemicals and is especially beneficial for those suffering from allergies and chemical sensitivity. No fossil fuels are used in the production of AmmoSorb ammonia control media.